We are excited to share this great recipe with you all, and hope you’ll get to make it for your sweetie this Valentine’s day! The end of the Yuletide season signals one thing: Valentine’s Day is just around the corner. There are a plethora of ideas on how to celebrate this day with our loved ones. But couples don’t need to leave their houses and spend lots of money on pricey dinner-dates in 5-star hotels or restaurants. One only needs an imaginative mind to transform a special night in to an extraordinary one. This dish is SURE to impress and it’s crazy easy to make! Set the oven to 200°C. Add the pepper in a roasting tin with the skin side up, then cook it with virgin olive oil for approximately 15 minutes. After which, combine and roast the tomato, garlic and chili on the tin for around 20 minutes until the vegetables are softened. Sans the oil, put the almonds in a pan and roast it until lightly golden. Do the same for the bread, which will then be sliced into bite-sized squares once toasted. 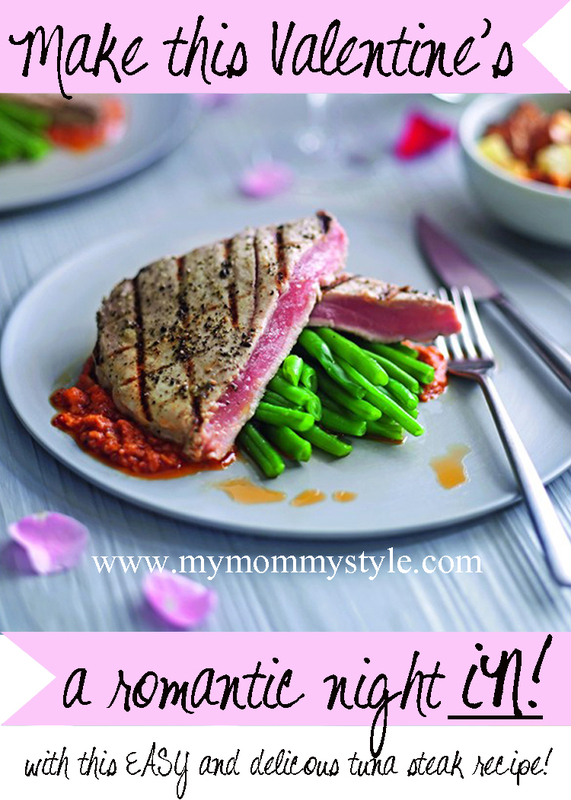 Grill the tuna marinated with paprika and Gamay red wine until cooked. Originally from the vineyards around Tours in France, the Gamay variety is especially recommended by M&S wine specialist Chris Murphy for its aroma and sweetness. (which is good to know since me and girls here of mms don’t drink. haha, we’d be useless for recommendations!) Today, it is now being produced in the wineries of California’s Napa County and Oregon’s Willamette Valley. Serve the tuna and roasted vegetables with romesco sauce, rosemary potatoes and green beans. Dessert: Valentine’s Day becomes even sweeter with servings of decadent chocolate cakes. Among the suggested treats are heart-shaped Triple Chocolate Heaven, Chocolate Truffle-Topped Cake, or Chocolate Ganache Mousse Cake.